Conservative Club | Launceston Then! Just across the junction from the town hall is the old Conservative club building built in 1914 to a design by Ernest Wise M.S.A. This was after a fire (below) in February 1913 at the previous building next to the surgery in Southgate Street destroyed the billiard room. 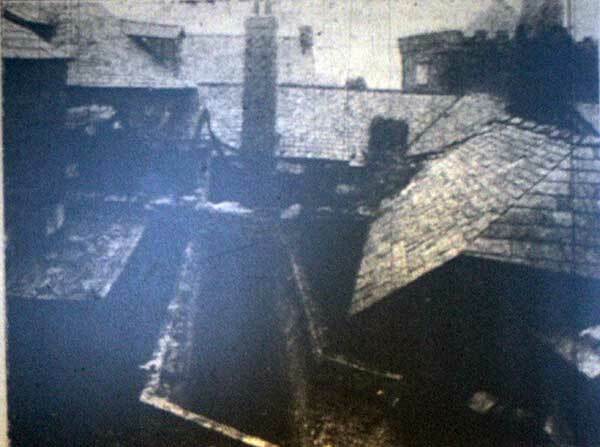 Above the rooftop view of the Constitutional Club after the 1913 fire. 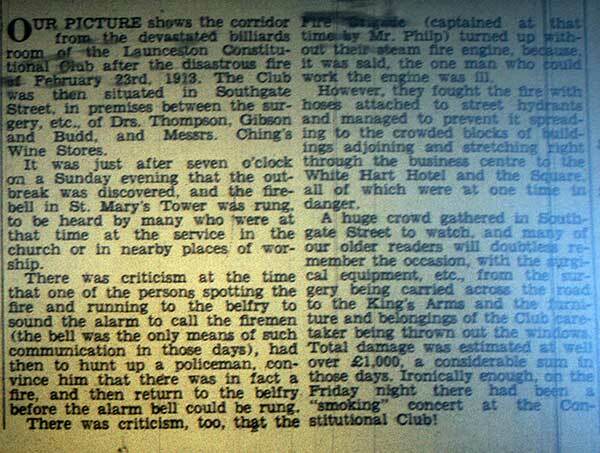 Below the report into the fire. Post & News 22 November, 1913: New Conservative Club. A Minute of the Highways & Buildings Committee, stated that the plans for the new Conservative Club to be erected on the Western Road, have been submitted and referred to the architect to alter where they did not comply with the Bye-laws. Alderman Kittow reported that a Building Committee had met and certain parts of the plans were referred back to a sub-committee to interview the architect, and the report was before the Town Council that morning. The Committee recommended that the plans be passed and that no objections be raised subject to the bedroom nearest to the yard at the back be not used as domestic offices. Agreed. Post & News 17 January 1914: TO BUILDERS, HEATING & ELECTRICAL ENGINEERS. Tenders are invited for the Erection and Completion of new Constitutional Club Premises in the Western Road, Launceston. Tenders are also invited for the lighting and heating of the above-mentioned new Club. The Drawings, Specifications and Conditions may be seen at the office of the undersigned, to whom Sealed and Endorsed Tenders must be sent not later than the 2nd of February next. The Committee do not bind themselves to accept the lowest or any Tender. Ernest Wise, M.S.A., architect, Launceston. January 10th, 1914. Masonry – Mr R Adams; £1,008. 19s. Mr E Medland: £1095. Mr E Sharland: £1,209. 10s. Mr Debman (Plymouth): £1,780. Carpentry – Mr JR Quick: £759. Messrs. Biddlecombe & Clifton: £759. Mr Debman: £805. Plumbing – Messrs. Gibard & Co.: £120. Messrs. Proctor & Kent: £91. 10s. Mr AR Debman £105. Mr TL Chapman: £82. Heating – Messrs. Procter & Kent: £85. Messrs Hampton & Co.: £97. Mr TL Chapman: £75. 10s. Messrs R Algar & Son: £81. Electric Light – Mt TL Chapman: £45. Messrs. RAer & Son: £40, 8s, 9d. Messrs Lord & Shand: £38. The following have been accepted: Mr E Medland – masonry. Messrs Biddlecome & Clifton – Carpentry. Mr TL Chapman – plumbing and heating. Messrs Lord & Shand – Electric light. C&D Post, 30 May 1914: Constitutional Club. The monthly meeting of the Launceston Constitutional Club was held on Friday last, when Dr WF Thompson was re-elected president, and the names of Major AC Thynne, DSC., and Mr Digby Collins added to the list of vice-presidents. Mr JB Slee was re-elected hon. secretary, Mr E Tregonning hon. treasurer, and Mr W Slee hon. auditor. The following were elected to the management committee:- Major M Body, Messrs. WH Symons, H Kittow, Colin Parsons, GAJ Stevens, Frank James, and SD Brimmell. Encouraging reports were given on the progress of the new club, and of the arrangement for the two days bazaar which is to be held in the Castle Green on Wednesday and Thursday, June 24th and 25th. 30 May, 1914: C & D Post. Launceston News: Constitutional Club. The Annual meeting of the Launceston Constitutional Club was held on Friday last, when Dr WF Thompson, secretary, was re-elected president, and the names of Major AC Thynne, DSO., and Mr Digby Collins added to the list of vice-presidents. Mr JB Slee was re-elected honorary-secretary, Mr E Tregoning honorary treasurer, and Mr W Slee honorary auditor. The following were elected to the management committee: Major M Body, Messrs. WH Symons; H Kittow; Colin Parsons; GAJ Stevens; Frank James, and SD Brimmel. Encouraging reports were given on the progress for the new Club, and of the arrangements for the two day bazzar which is to be held on the Castle Green on Wednesday and Thursday, June 24th and 25th. 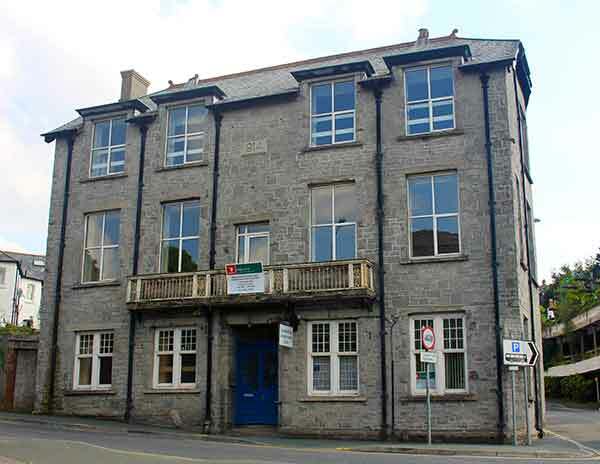 First mention – 1883: Launceston Conservative Association and Working Men’s Club; rooms in Northgate Street. Christopher L Cowlard, secretary; George Clifford, caretaker. 1889 – Thomas Headon, secretary, Walter Hambly, caretaker. 1897 – same. 1902: Constitutional Club, Charles Beddoes Shuker, hon. sec, Hambly caretaker. 1906: Sydney Brimmell and William Wise, hon. secs. 1910: John B. Slee, hon.sec. 1914: Constitutional Club, Guildhall Square, J.B. Slee, secretary. 1919: S.D. Brimmell, acting sec. 1923: NH Reed, hon. sec. 1926: Hon Sec. W.B. Knowles, 9 Western Road. 1935: W.R. Mitchell, hon sec. 1939: R. Gibbens, hon sec.